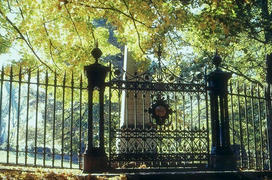 Thomas Jefferson is buried at Monticello with other members of his family in a graveyard chosen by him in 1773. Laid out upon the death of his closest friend and brother-in-law, Dabney Carr, this plot is still owned by an association of Jefferson�s descendants through his daughters, Martha and Maria, and is still used as a cemetery. Despite Jefferson�s astounding range of accomplishments, the epitaph he wrote for his tombstone included only: "Author of the Declaration of American Independence, Of the Statute of Virginia for religious freedom, and Father of the University of Virginia."